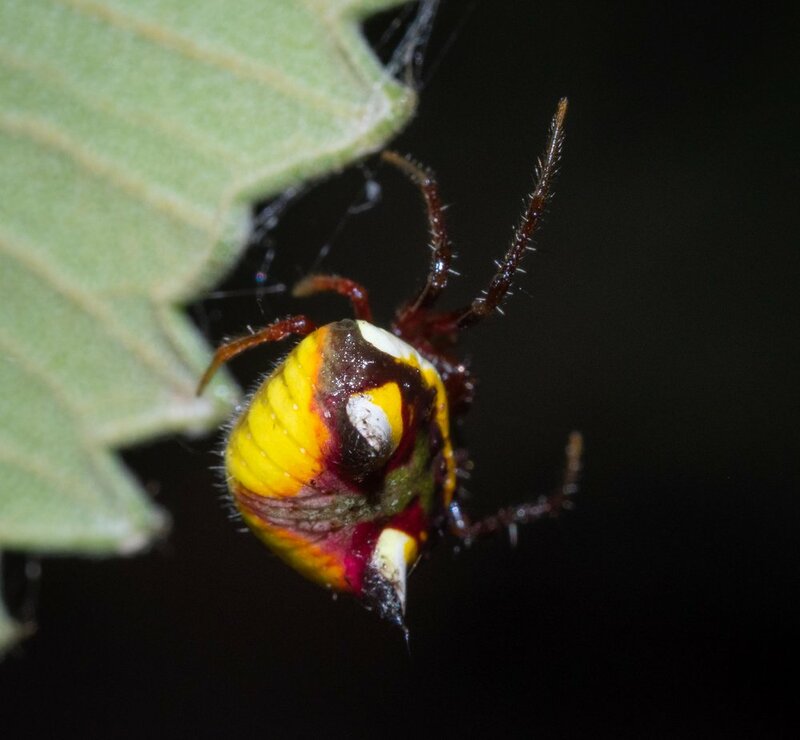 We first spotted this pretty spider in early May. She has made her home at the edge of a Banksia, conveniently at head (and camera) height. Her striking colours and shape keep us going back for another look ... and yesterday I noticed that she has babies! The photos above were taken after dark (8:40pm) last night. It was a windy night, and she had not built her usual web. Instead, she was simply hanging from leaves at the edge of the Banksia. Behind her, tying together a cluster of leaves, was a meshwork of silk. And suspended in the middle of the mesh, a rather large, brown cocoon ... with a cluster of tiny spiderlings! I noticed that the tight ball of spiderlings that I'd seen during the day was much more active and spread out at night. Were they about to disperse completely? No, it turns out. It seems to that they, like their mother, are nocturnal. When I checked them again this morning, they had regrouped into a ball. 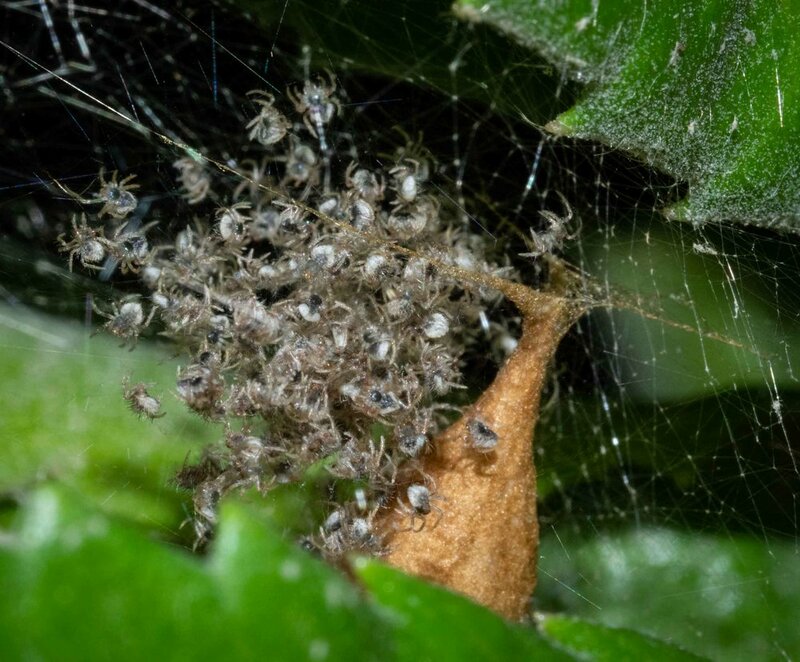 A closer look, and I discovered a second, smaller egg case within the nursery web. Whether this one is full of developing spiderlings, or vacated previously, I can't be sure. However, it does appear to be intact. Notice the strengthened silk cable and supporting strands, holding the case clear of the surrounding leaves. Both cases are remarkably similar in shape. A second egg case, smaller and quite likely to be still full of developing eggs. Poecilopachys australasia turns out to be a reasonably well-known species, for a spider. This is partly due to it being so attractive - a magnet for anyone with a macro lens! It is also because the females will make their home in any convenient shrub or small tree - including backyard citrus trees. The species has gained some additional fame in New Zealand. It first appeared there in the early 1970s, and has since become widely established. Locals are rather wary of new spiders, so when people see one for the first time it can even make the newspapers! Only one native New Zealand species is venomous (to humans), but some arrivals from Australia have developed a bad reputation. 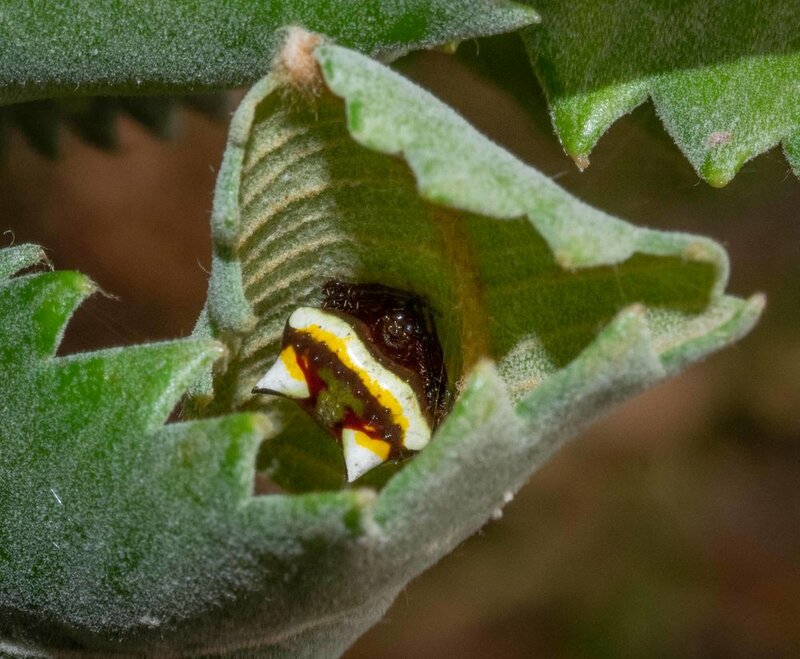 Poecilopachys australasia is, however, quite harmless. Another reason for its fame is the species' rather specialised web construction*. The method by which she creates the cross-strands, and the pattern of sticky versus dry silk, is apparently quite different to that of many other orb-weaving spiders*. 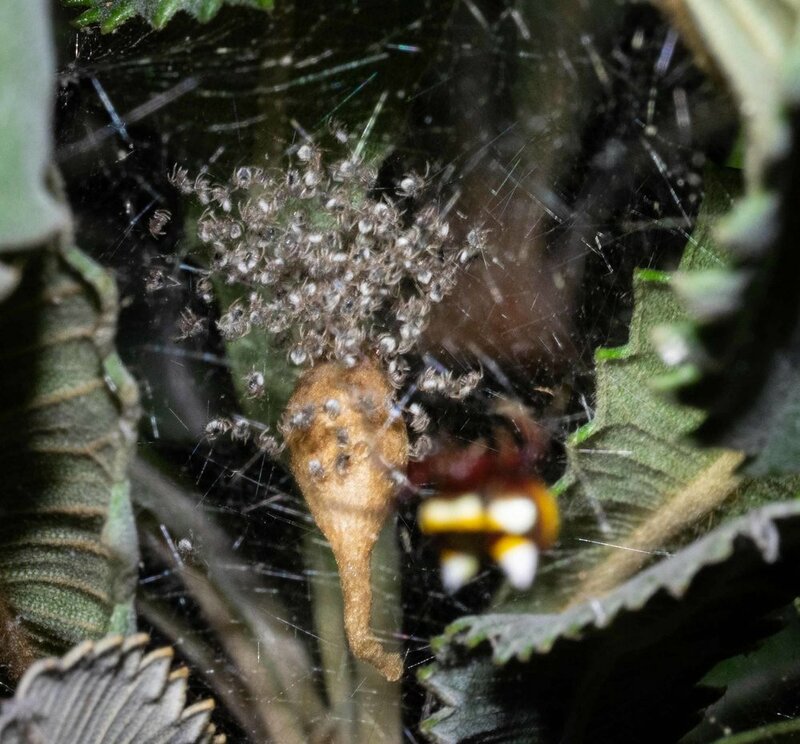 The resulting web is quite sparse, a feature shared with other members of the Orb-weaver subfamily Cyrtarachninae ( the 'Shiny Orb-weavers'). We certainly noticed that the web is very open, nearly horizontal, and quite 'loose'. That is, the cross-strands are not stretched tight but rather wave about with the slightest movement of air. The loose web means that when a moth is snagged, the flapping insect tends to hang below the web and so cause minimal damage. 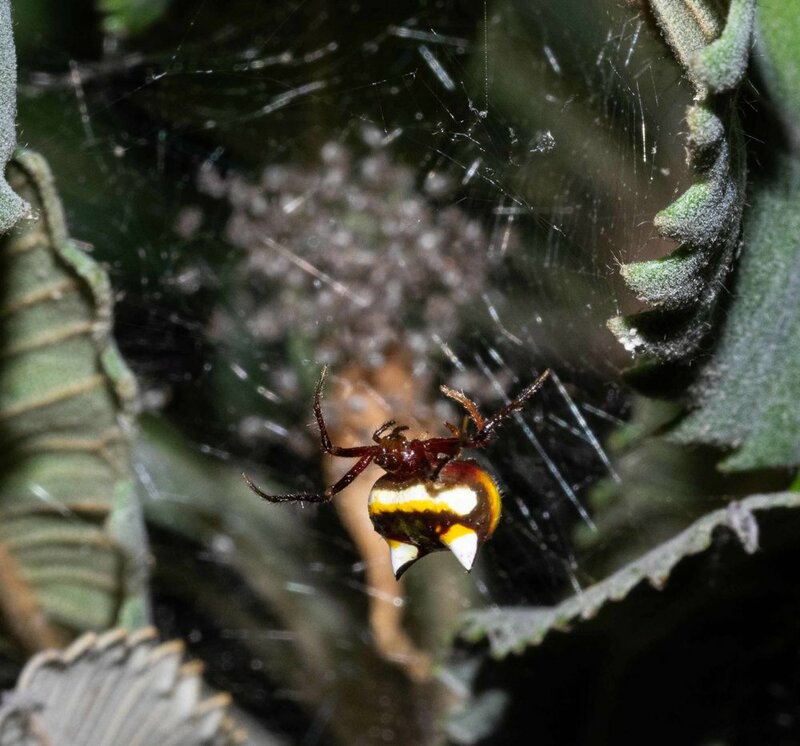 The female then performs the usual spider trick of immobilising the prey with venom, and parcelling it up in silk ... all the while suspended beneath her main web. It has been reported that the females are hairy when young, becoming shinier as they grow. This is certainly the case with our girl. She's now very shiny and does seem to have grown since we first met just over two weeks ago. Much of this accords with what we have observed here in the forest. We have yet to see an adult male, and may not. They're only 2mm long and are apparently only drawn to the female's retreat for a brief mating period. But I will keep looking! Clyne, Densey. Notes on the web of Poecilopachys australasia (Griffith and Pidgeon, 1833) (Araneida: Argiopidae) [online]. The Australian Entomologist, Vol. 1, No. 3, Apr 1973: 23-29. Link to article. **May, B.M. & Gardiner, D.I. 1995 (?) 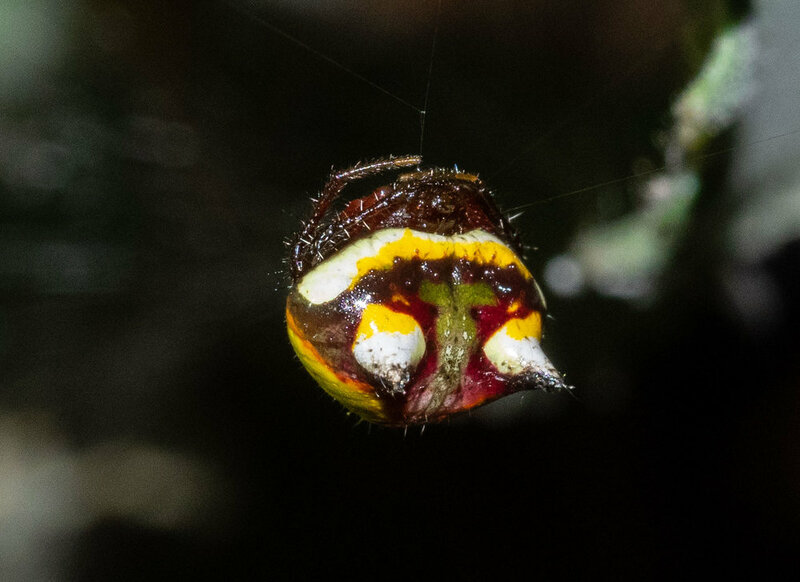 Observations on the Australian "Two Spined" spider Poecilopachys australasia in an Auckland Garden. CiteSeer. Link to Article.